Texas RFID case: Judge upholds Northside Independent schools' tracking program. 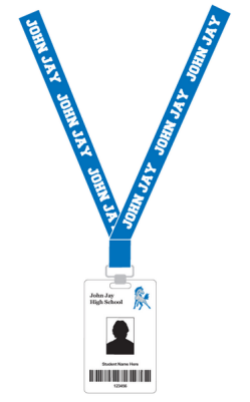 An illustration shows the ID cards that John Jay High School students are required to wear. They include embedded RFID chips that can pinpoint the student’s location on campus. A Texas public school district’s controversial pilot program to keep track of its students on campus with Radio Frequency Identification (RFID) chips has survived a legal challenge in federal court. On Tuesday, U.S. District Judge Orlando Garcia dismissed a request for a preliminary injunction from Andrea Hernandez, a sophomore at John Jay High School in San Antonio who refused to wear the school’s ID cards on religious grounds. The girl’s evangelical Christian father, Steven Hernandez, had equated the badges to the Biblical “mark of the beast.” Northside Independent School District officials told Andrea last fall she would have to either wear the card or transfer from John Jay, a magnet school, to her local campus, which is not part of the RFID pilot program. Lawyers from the nonprofit Rutherford Institute took the girl’s case, seeking an injunction to block the school from enforcing its policy. Tech blogs, civil rights groups, and even Anonymous joined the fray on the family’s side, calling the RFID badges an egregious invasion of privacy. But as I reported in November, the outrage overlooked a crucial fact: The district had offered Hernandez a compromise, allowing her to wear the ID card with the chip removed. She and her father refused, saying that would amount to showing support for a program that violates their religious convictions. The judge disagreed. In a 25-page ruling, he wrote that Hernandez’s refusal to wear the badge even without the tracking chip undermined her claims that the district was violating her religious freedom. “Plaintiff’s objection to wearing the Smart ID badge without a chip is clearly a secular choice, rather than a religious concern,” Garcia wrote. Very recently, a parent of a special needs student was concerned that the child did not get on the bus after school, and the school staff was able to pull the sensor readings to determine when the student was on campus and when he left, thus reassuring the parent. On another occasion, a building was evacuated and campus administrators were able to quickly identify and locate students’ badges that had been left in the building during the evacuation. Garcia also dismissed a separate claim that requiring Hernandez to wear the ID card without the chip would violate her freedom of speech. While students in public schools “do not shed their constitutional rights to freedom of speech or expression at the schoolhouse gate,” he wrote, they don’t automatically have all the same rights as adults would in other settings. The judge concluded that the student must either accept the school’s compromise and wear the badge without the chip, or return to her home school next semester. So it seems that the appeal, too, will focus on religious beliefs rather than privacy concerns. That’s a shame, because the privacy issues around the use of RFID chips in schools (and elsewhere) are far more interesting. Let’s hope they get a thorough airing—somehow, somewhere—before the technology becomes so pervasive that we take it for granted.